The 2018-2019 CleanTech Alliance Breakfast Series sponsored by Perkins Coie presents notable cleantech executive speakers for a monthly conversation followed by networking with 100 cleantech industry leaders from across the region. A different speaker and topic is presented on the second Wednesday of each month (7:30 a.m. to 9:00 a.m.) from September through May (except October, which is reserved for the Energy Leadership Summit). Virtual attendance options are available through a live webinar feed. Contact Rachelle Ames for more information. 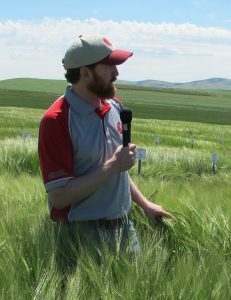 Dr. Kevin Murphy, Washington State University will be focusing his presentation on the role of crop diversity as a key tenet of sustainable agriculture, and how the power of plant breeding can be harnessed to address environmental issues such as soil erosion, water quality, and poor air quality. Intelligent utilization of multiple crops that fill distinct niches in an agroecosystem improves the ability of farmers to manage weeds, diseases, water usage, and insect pests while reducing tillage and chemicals that can negatively impact water, soil and air quality. Through the introgression of key traits often found in crop wild relatives, new varieties can be bred for traits such as increased root growth and perenniality which reduce our reliance on carbon-producing farming methodologies for management, while improving the environmental performance and ecosystem services of the cropping system. He will also share how research can help overcome production and market obstacles that enable the successful introduction of alternative grain and seed crops and its role in providing climate-friendly, and importantly, nutritious and delicious food choices for consumers. Featured Mark Mueller-Eberstein of Adgetec and Greg Robinson of Drift. Featured Susan Jones of atelierjones speaking about cross laminated timber. Featured Matt Knapp of ZUNUM Aero speaking about hybrid electric aircraft. Featured Alex Bernhardt of Mercer Investments on climate change insurance. Featured Eric Beckwitt of Freightera on automating and reducing emissions from freight transport. Slides. Asterisks recap from Russ Weed – CleanTech Strategies. Featured Erin Rothman of StormSensor speaking about using AI sensors to monitor stormwater. Slides Pt 1, Pt 2, Pt 3. Featured Richard Barnes from DNV GL speaking on on the energy transition for the maritime and power sectors, and how it is applicable to currently developments in Washington State.